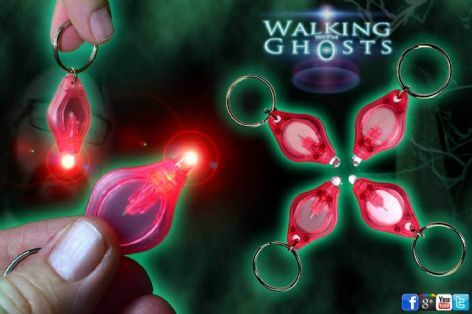 These mini red (Wavelength: 650-670 nm) flashlights are one of the handiest paranormal investigation tools you can have. Each little flashlight is small enough to attach to bags, keys, equipment, and clothes. The vibrant red led is bright enough to give an instant light in dark situations but low key enough as to not upset others around you. We have all had those times fumbling in bags looking for equipment in the dark, which is where this little beauty comes into its own. Hang one around your neck so you know you always have light when you need it moving around in the dark. They have a press to activate short burst function and also a separate on-off switch for hands-free use. The Red LED emitter sits at a about 650-670 nm on the Wave Length light spectrum and is a deep visible red light. It is ideal for experimental narrow wavelength investigation techniques and also very useful for general purpose use as it illuminates vividly without over lighting the area and maintains the illusion of a dark moody environment. As it is thought that spirits or ghosts may be more visible in certain kinds of light the use of various spectrum specific light is becoming popular in the paranormal investigation field. Long established in the forensic research area narrow bands of light colors both visible and invisible to our eyes can highlight different organic materials and cancel out certain colors making a shaper contrast image. The same philosophy is being applied by the paranormal researcher trying to find new ways to reveal evidence on investigations. The principle of the theory is that by reducing the visible light to a very narrow band of the spectrum we may see things that would otherwise go unnoticed in a full spectrum white light. Using both invisible & visible colored lights with full spectrum cameras is thought to be a way to see more from the other side than we could with the naked eye.